A potent botanical combination of highly concentrated ginkgo biloba to support cognitive function with blackcurrant flavonoids. Ginkgo biloba is the world`s oldest living species of tree and the leaves of the tree are used in modern herbal medicine. Medicinal use of ginkgo can be traced back almost 5,000 years in Chinese herbal medicine. Ginkgo helps the maintenance of good cognitive function. 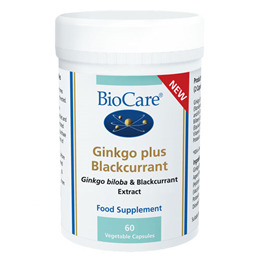 Ginkgo extract contains ginkgo flavone glycosides and terpene lactones. Ginkgo Biloba Extract (Ginkgo biloba Leaf), Blackcurrant Extract (Ribes nigrum Leaf), Capsule Shell (Hydroxypropyl Methylcellulose), Bulking Agent (Microcrystalline Cellulose), Anti-Caking Agents (Ascorbyl Palmitate & Silicon Dioxide), Maltodextrin. 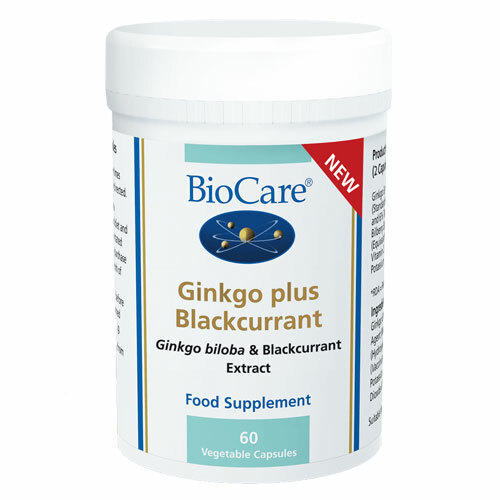 Store in a cool dry place away from direct sunlight and heat..
Below are reviews of Ginkgo plus Blackcurrant - 60 Capsules by bodykind customers. If you have tried this product we'd love to hear what you think so please leave a review.